To whom do the millions of adult Jewish males who never had a circumcision turn? Let's say you are a 45-year-old Jewish man living in Israel after moving from Russia several years ago. You grew up without any Jewish education but remember that your grandfather wore a kippah and beard, prayed frequently and had these black boxes he would put on his head. Recently, you have been thinking a lot about him and began looking into your Jewish heritage. You buy a book on Judaism at the corner book store. Over the next few weeks you read, learn, discover, and it feels strangely familiar. Then, like a flash, you realize that something has been missing all these years…a circumcision. And you wouldn't be alone. You would be one of millions. Called a Brit Milah in Hebrew ("covenant of circumcision"), it is the first mitzvah which Abraham, the first Jew, received from G‑d. Central and fundamental to Judaism, the brit represents the finishing touch that perfects our bodies. That it should be a human act demonstrates that spiritual perfection must and can be accomplished through human effort. "The largest number of Close to one million Jews in the world never had a circumcision. uncircumcised Jews today are Russians who never had a chance to fulfill the mitzvah," says Rabbi Yaron Amit, founder and director of Brit Yosef Yitzchok, which has provided for over 33,000 adult circumcisions since opening in 1989. "Besides them, close to one million Jews in the world never had a circumcision, and then there are countless Jews who don't even know they are Jewish." Brit Yosef Yitzchak is based in Israel and maintains branches around the world. It was founded by Amit when the Iron Curtain fell and hundreds of thousands of Russian Jews, previously forbidden to practice Judaism, began reclaiming their heritage. "I was involved in some charity projects and a friend asked me to help raise money for seven circumcisions for newly arrived Jewish immigrants to Israel. I found the money and then they asked for help with another seven..." tells Amit. "The number of immigrants requesting help with their own circumcisions was staggering. It was clear that world Jewry had a huge need in this area." A father has the primary obligation of providing for his son's circumcision. When the father is either not present or fails to arrange for the circumcision, the Jewish community assumes responsibility. Once the child reaches Bar Mitzvah age, he becomes personally obligated to arrange his own circumcision. 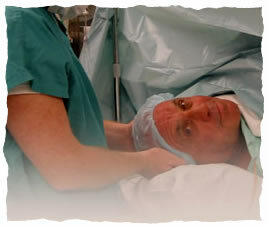 Typically performed on an 8-day-old baby, a brit is a bit more complex for an adult, and most mohelim (trained ritual circumcisers) are inexperienced in the procedure. From start to finish, Brit Yosef Yitzchak handles outpatient hospital arrangements which include licensed doctors, expert mohelim, post-surgery care and family support professionals. "The procedure itself is painless, though it takes time to recuperate. We make it into a party where they get a Jewish name and a chance to put on tefillin. They all walk out on their own and dance with us to celebrate." Their work has touched thousands of lives, and they have the stories to prove it. Last month a man called the office and received a circumcision. "For fifteen years I went back and forth over doing it. I would wake up in the morning, see on my dresser your ad that I had cut out, pick up the phone to dial and then hang up," he told the staff. "I finally said to myself, 'Either I do it now, or I'll go on for another fifteen years like this.'" Six months ago An Israeli soldier from a Russian family took a two week leave to have his brit done. It ended a lifetime of pain, struggle and embarrassment. an Israeli soldier from a Russian family took a two week leave to have his brit done. It ended a lifetime of pain, struggle and embarrassment. "I never got a brit because my parents thought it was primitive and they wanted to spare me from it. But for as long as I can remember I was embarrassed in school, around my friends. I dreaded having to change before going swimming. Even recently, in the army, I made sure to be the last in the shower," he revealed at the celebratory meal after his circumcision. Then an army friend of his suddenly and quietly took a two week leave. "He told me he had contacted Brit Yosef Yitzchak about getting a circumcision and was granted time off. I was still so embarrassed and told him I had a neighbor at home who would be interested and could he give me the number. I'm so glad I called." Because this religious service is only for Jews, each participant's Jewish identity is thoroughly researched. Staff members check papers and investigate the family lineage, sometimes going as far back as three generations. An immigrant student in Jerusalem wanted to have a brit but had no documentation or birth certificate to verify his Jewishness. His mother, however, has a 70 year old brother who lives in Ashkelon who had paperwork certifying the family's Jewish heritage. Initial requests for the documents were rejected. Many discussions later, the uncle accepted an invitation to come celebrate the brit and bring the paperwork. The documents were accepted and corroborated by further research. At the procedure, the uncle revealed that he also never received a brit. "I saw a few people come out after having their circumcision done. They were so happy. I decided then and there to also get a brit." Having a brit, regardless of one's age, is a powerful and transformative process. Those who have benefited from Brit Yosef Yitzchak's service constitute a family with many maintaining regular contact with the staff, and still others volunteering or working as staff members. Countless Jews have used the experience as a jumping off point for deepening their commitment to and practice of Judaism. "We've been able to help a lot of Jews get their brit milah, but that only scratches the surface, our work is really only beginning. In New York alone there must be close to 200,000 uncircumcised Jews. Honestly, most simply have no idea of just how important and simple a brit milah can be." Zalman Nelson is a licensed therapist, online counselor, and freelance writer/editor. His private practice fuses modern therapeutic techniques with the ancient Jewish wisdom of Kabbalah and Chassidic thought. He lives in Israel with his wife and five children. Connect with him here. Hospital Circumcision If a Mohel did not perform the circumcision then a "Hatafat Dam Brit" (drawing of blood) will be done by a Mohel to ensure that one fulfills the Mitzvah of Brit Milah properly. F.R.E.E. Circumcision Program I had my bris done through the Free circumcision program and the rabbi assisted me within 24 hours! I am amazed at their professionalism and I would recommend any person who is seeking a Brit Milah to contact this wonderful organization that did everything at no charge. This was a great help to me in spiritually and financially. Now I finally feel like a complete Jew. Never Too Late for a Brit Abraham was 99 years old when God told him to circumcise himself and all the males in his family. I'm a Reform Jew, and I embrace circumcision 100% not only for my faith, but also for aesthetics, hygiene, and sanitation. brit vs. intelectual reasoning to the mother below, yes the Jewish people perform the brit in a manner far safer than the conventional hospital. The brit is not just a tradition! it is a very serious commandment from the Torah! Before making such statement about this important mitzva, please read into what this mitzva is about! It is far from being intelectual to jump to conclusions before doing proper research. The brit just happends to be medically beneficial, it has been proven to lessen the spread of the AIDs virus from an infected woman to a circumcized man by 50% for example, but the reason the Jews are commanded to perform it, is not a medical one! Intellectual Strength versus Tradition OK, I'm a Mom, and I guess this is a mens' subject. However, I signed for the circumcision of my son where it was given as a matter of course in a Toronto hospital. I was extremly dismayed and heartsick to see the cut, swollen tissue and plastic clip upon my tiny newborn. Nevertheless, if sphegma can carry cancer and cause terrible vaginal cancer, it is an imperfect condition, to be sure. I have always revered the work of Josheph Chilton Pierce, whose book, Crack in hte Cosmic Egg, suggested that people aspiring, thinking together and concomitantly evolving the material of a reality can just as well remove (at first, in the minds' eye) the cancer carrying capability of DNAs nucleotides producing the sphegma. It can be done- a society can diet, use nano-technology, and also medicine toward NEVER having cancer in the first place. eg: eat less cancerous meat. There also is a great Segula in participating in this mitzva, either as a Sandick, Mohel or finacial supporter. Brit Milah I am a Roman Catholic. On the eighth day after my birth I was circumcised. I was told this by my mother. Years later I asked my mother "why?" I was told that I was curcumcised because it was the Law; the subject was dropped. I never gave it another thought until I read this article. Both of my parents have a European history, my father especially.